PHILADELPHIA, PA — Let Freedom Ring (LFR), a public policy non-profit organization committed to promoting Constitutional government, economic freedom, and traditional values, today released national survey results that show strong support for terminating the current federal tax code at the end of 2019 as a way of forcing tax reform. The national survey of 1,008 respondents was conducted last week by McLaughlin and Associates, a national polling firm. Respondents were asked, “Would you support or oppose terminating the current tax code at the end of 2019 as a way of forcing the Congress to enact tax reform before then? Earlier this year LFR launched Sunset The Tax Code, a broad, nonpartisan effort to set a January 1, 2020 deadline for tax reform by passing legislation which lets the current tax code expire by that certain date. Legislation to sunset the code has been filed in the House by Congressman Bob Goodlatte (R-VA), where it has 81 cosponsors, and it is being ushered through the House Ways and Means committee by Congressman Kevin Brady (R-TX). 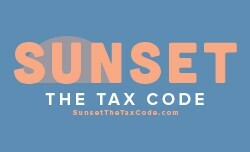 Citizens who wish to learn more may visit: http://www.SunsetTheCode.com.